This is a literacy center with 6 sentences for students to unscramble. 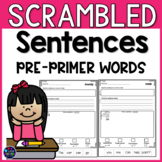 There is a recording sheet for students to write the sentences after they unscramble them and there is also a set of blank cards for you to program your own sentences. 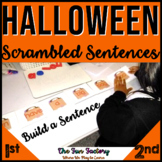 This is a literacy center with 2 sets of 6 sentences for students to unscramble. Each set has 2 levels of reading difficulty. This file is also editable. There are blank sentence cards with pictures for you to program your own sentences to meet your students' needs. 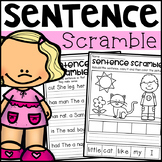 This files contains 40 pages of "Scramble Sentences" for kindergarden or 1st grade. The kids will have fun cutting and gluing on the sentences together. 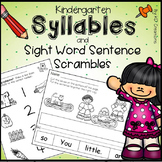 This activity can be used as an independent literacy station in Kindergarten or First grade. Laminate sentences and cut apart. Have students unscramble the sentences. They can then write the sentence on the record sheet and illustrate it in the box.